I often wonder what one would do all day without hobbies. Reading can only take up so much time. Yesterday, I was lucky to have a friend take me to see the surgeon and get my stitches out. Yippee, now I can shower. Still no driving or using the arm for another month. I will start physio with passive exercise only. I'm happy to be patient, well let's saying doing my best, because the doctor said the outcome should be good. After my appointment, we met another friend for lunch and visited Walmart. That took up half the day at least. This morning, I put a roast pork into the crock pot with a homemade sort of barbecue sauce. 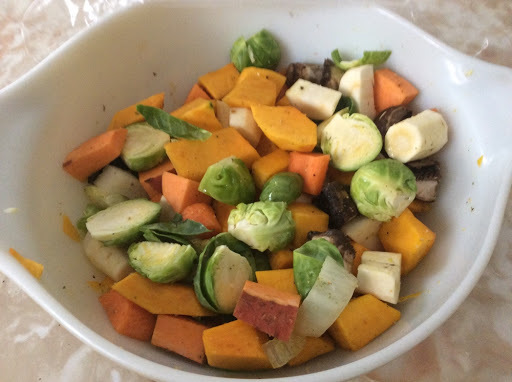 I decided I'd like to roast a pan of veggies instead of adding them to the pot. I've been cutting them left handed a bit here and there all morning. I also did a wash and hung it downstairs. Not very exciting but I'm happy to find an activity I can do. Yesterday, I walked in the sub division since it was so beautiful. Today, I've decided to stay inside. It's damp and gray. 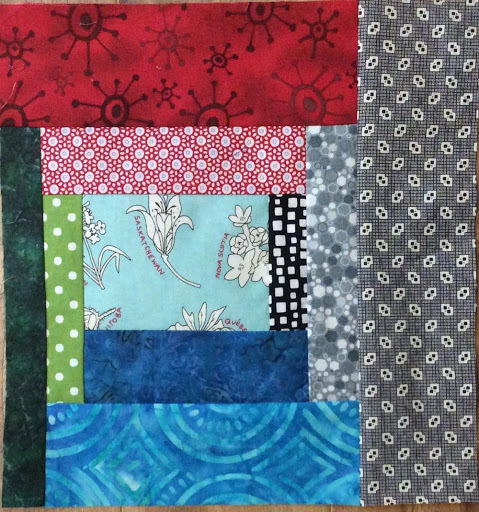 After lunch, I finished up one block for quilts that our guild is making for Ronald McDonald house using the Canada 150 fabric as the focus fabric. I started the second one. It feels good to be able to do something although I can't do it for long as the sling tends to strain the back a bit when sitting at the machine. I can always rest and go back to it. I've now got all the mistakes fixed- and there were several- and got another block almost together in the Trip Arounf the World blocks. I can get the rest of the strip sets together as they're all cut. After that, I'm hoping to bribe a friend into cutting them up for me. 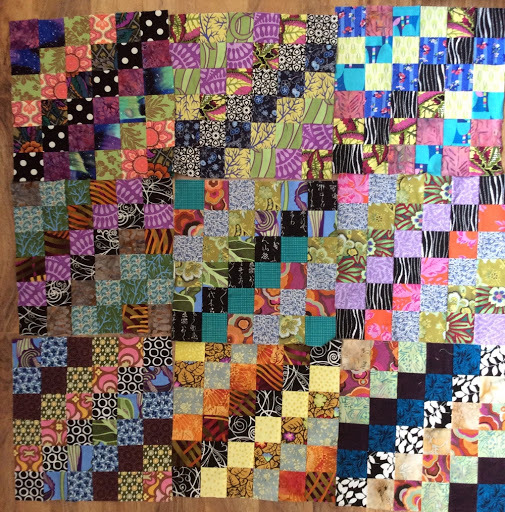 I think twenty blocks finishing at 12" and I'll add borders. I've saved the best for last. 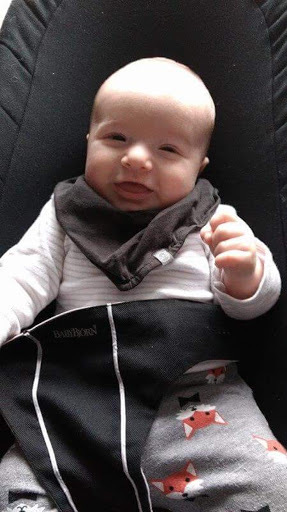 A pic of my grandson, first thing this morning. My daughter said he's a morning person like her. Definitely not me! I thought I would be really bored recouperating from this surgery but not so! Grant it there are lots of things I can't do; there's nothing wrong with my legs or my left arm though and I've been finding lots to do as I feel better from the surgery. I've been needing to do some sorting in my storage areas. Who doesn't! Obviously not heavy stuff. I can, however, pull out smaller items to add to a giveaway box. It's getting full!I don't go at it all at once, just when I need to get up and move about. I finished the book, The Improbability of Love; it's excellent! I also realized while sorting a few things in the studio that even though I can't do free motion work, I could likely do some regular piecing as one feeds with the left hand. 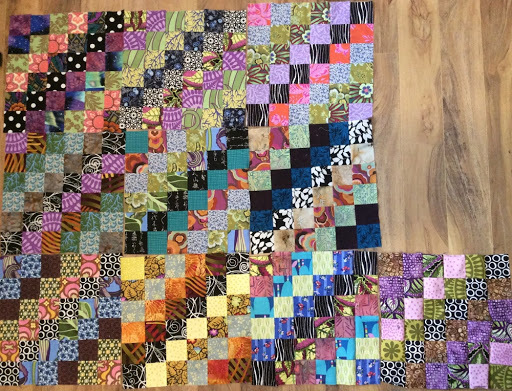 I happened to have a box with some Trip Around the World blocks done, and all the rest of the strips are cut. I can strip piece easily. Good thing I laid it out. I discovered a mixed up block. Can you spot it? I'll fix it later. ( since I posted, I found another block, lol. No wonder I'm into fiber art!) 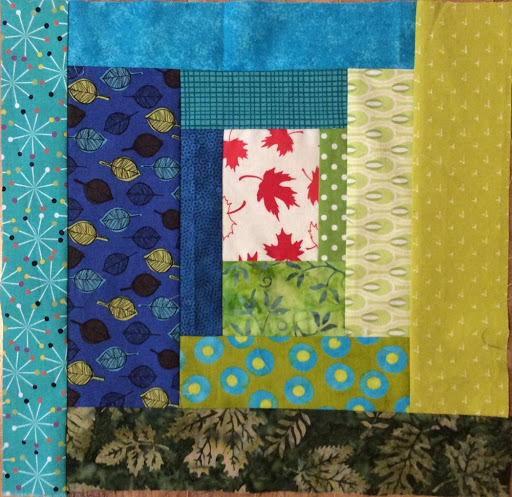 I plan to do 20 blocks for a 4 by 5 arrangement with borders. 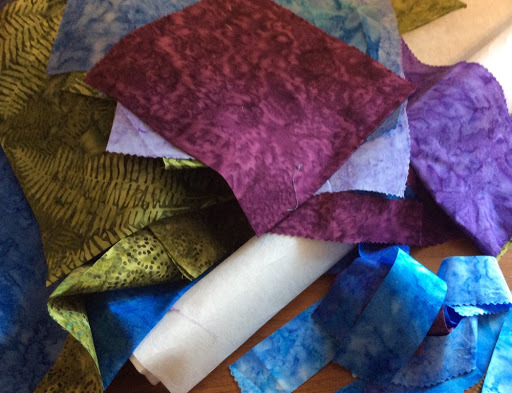 As I've gotten more and more into art Quilting and traditional Quilting, In recent years I've really let myself get caught up in new things, thus resulting in too many UFO's. I must look at this time as an opportunity to organize and get some things done or to give them away. It's going to feel good. I'm writing a short post (left handed and slowly) to let you know that I'm here and recovering from my shoulder surgery. It'll be a week on Tuesday so I'm slowly coming around. For anyone having gone through any surgery involving a general, you'd know the drill, wooziness, nausea, vomiting (maybe), pain, constipation and more. I see the doctor after 2 weeks to remove the dressing and find out what's next. I was told I'd have to wear the sling for 6 weeks, yuk, and then no lifting or heavy work until 3 months with lots of physio. On the bright side, I can sleep in bed and I'm actually more comfortable there. Also, the doctor said she was very pleased with the surgery. I will do my best with my restrictions and physio. So, probably no sewing for a while. 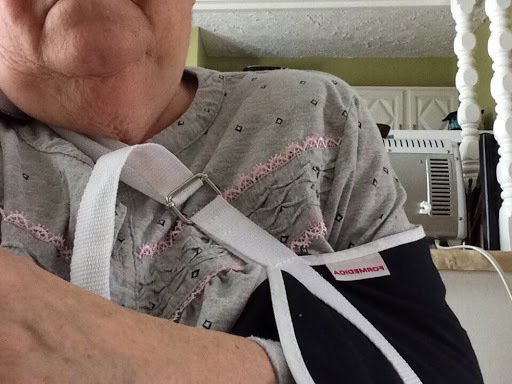 I should also be able to out for walks once I'm more stable and I figure out how to get my jacketed arm in a sling, lol. Ive been wearing pyjamas for a week! I also discovered a new show on Netflix, Paradise, about the beginnings of a department store in the 1870's. I'm reading The Improbability of Love by Hannah Rothschild. I finished a book but can't find it and can't remember what it was, lol. 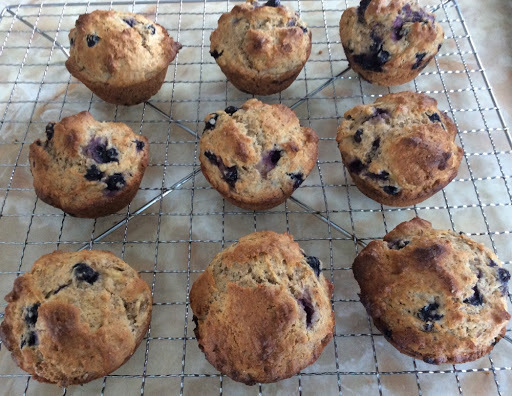 This morning, I made one handed muffins! Blueberry banana. Wherever you are I hope you're enjoying the day in your own way. My hubby has gone off for a ski. He needed to get out. 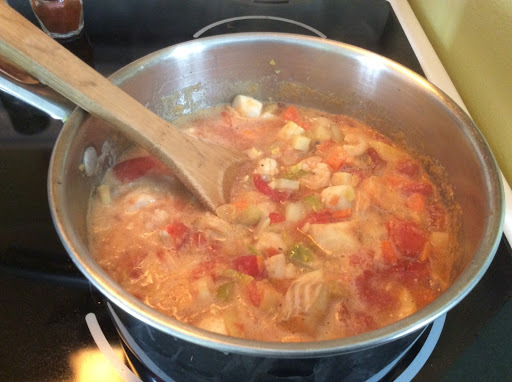 After breakfast out with hubby and then groceries, I got a seafood stew made for supper. It's basically the same as starting a chowder except with a few different veggies and stewed tomatoes instead of milk. Paprika, turmeric and saffron are good herbs for this combo. 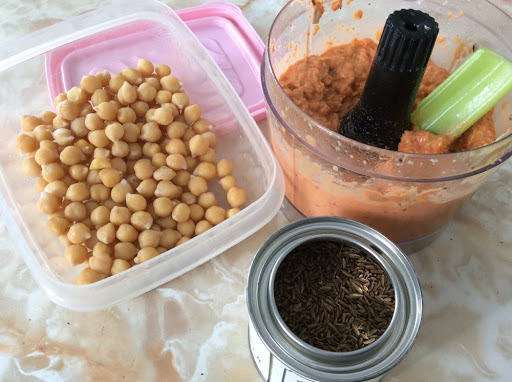 Then, I took the time to clean out the fridge a bit of leftovers and I made a red pepper hummus using chick peas I'd cooked this week. Once that was done and my bed linens were in the wash, I headed to my sewing studio. I did a bit of a clean up and it cane to my attention how many pieces I have underway. I've got to make an effort after my shoulder recovery to finish up some things! 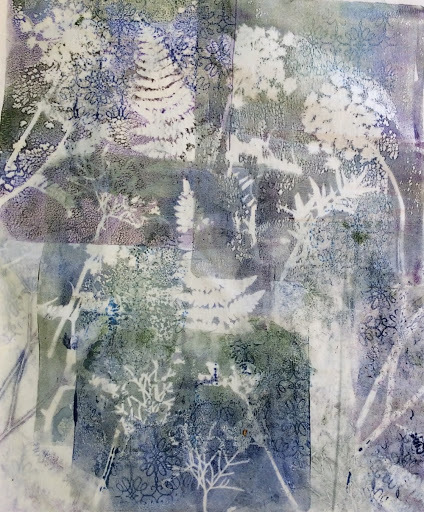 Before my surgery, I really wanted to try out some stitching on the layered monoprint. I wasn't sure about it at first, but it's really growing on me. Kind of excited! 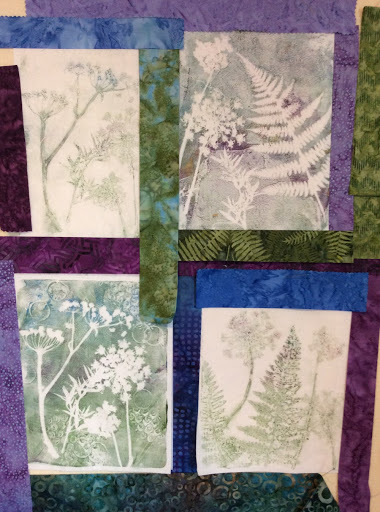 I'm using silk threads in different colors, green for the printed ferns and plum for the Queen Anne's lace. You can see in the following some lace as yet unstitched compared to the stitched one. It better be a speedy recovery so I can get back to it soon! And here's my Ollie pic. 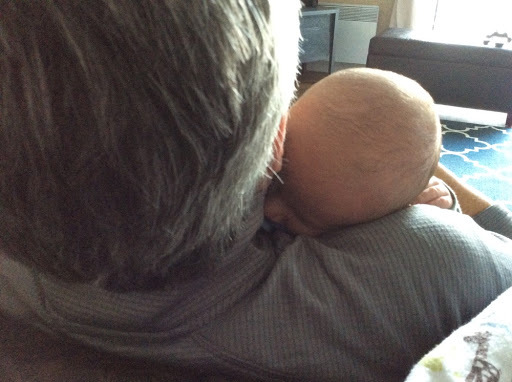 I now understand the love of a grand parent. It is so different than as a mom. Oh so very special. We've had beautiful winter days here recently (except for the snow day Wednesday) and I've been trying to get out and enjoy it before my shoulder surgery next week. At the same time I've beeen trying to get some of the I deas out of my head while as well as cleaning up my studio space a bit. Yesterday, I had my pre op tests and then I went snow shoeing with my snow shoe buddy who I haven't been out with for some time. 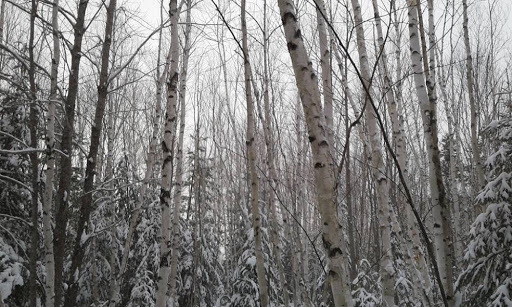 Is it any wonder why I love birch groves so much? Sometimes the soft quality of the gray sky that is lightly lightly glowing with pastel is even prettier than a blue one. 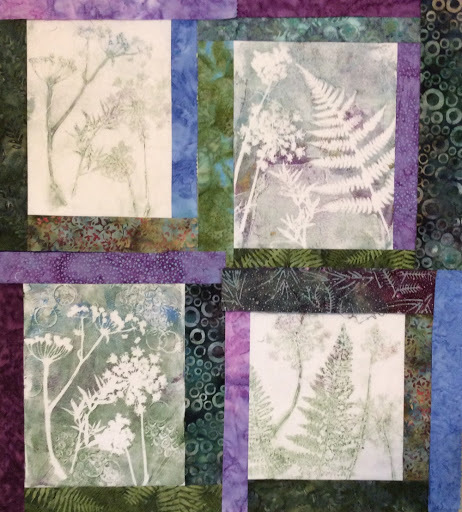 When I've had time, I've been cutting strips and sewing them onto four monoprints. It has changed even some since this photo. I've just packed it up for our guild UFO day tomorrow as I'd like to get it together before Tuesday. 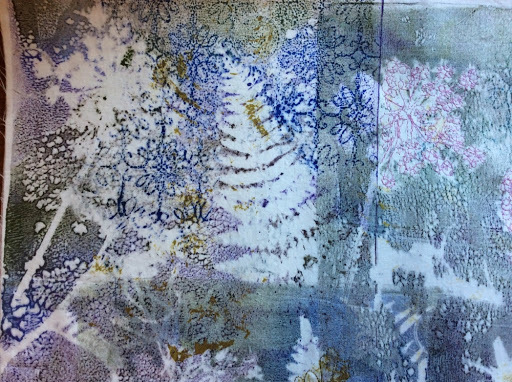 As if that wasn't enough I've squeezed in a little more Gelli printing. 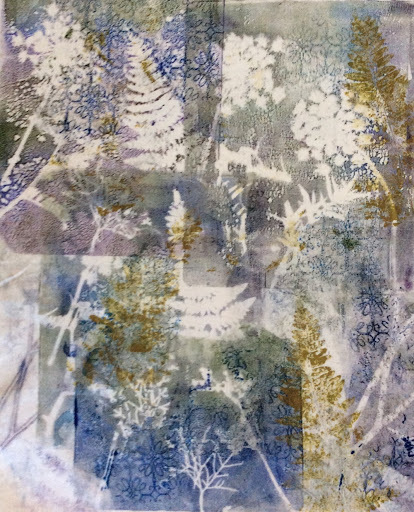 For some time, I've been thinking about trying out layering the prints as I do them onto one larger piece of cotton-- both the print and it's ghost print. It may seem like a no brainer for some but it really was a bit experimental for me. I liked the one above the best. 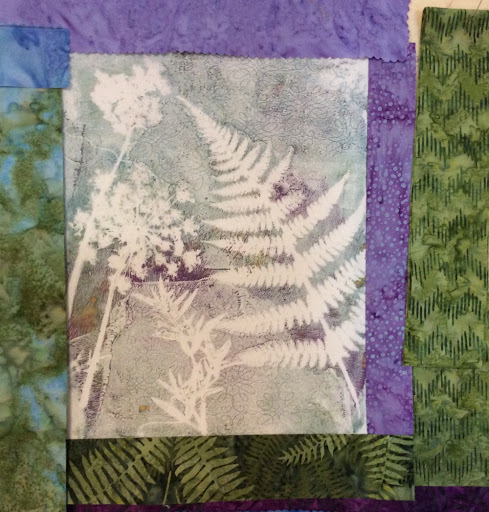 I took it a bit further by printing some green fern leaves on top. I used natural light for the second photo but The colors are a little more intense in the pic than in reality. Maybe because of the lateness of the day. I'll have it up on my design wall while I recuperate so I can think about how to proceed. I'll probably use my usual black free motion outlining to start. I'd also like to incorporate more hand stitching than I've done of late. 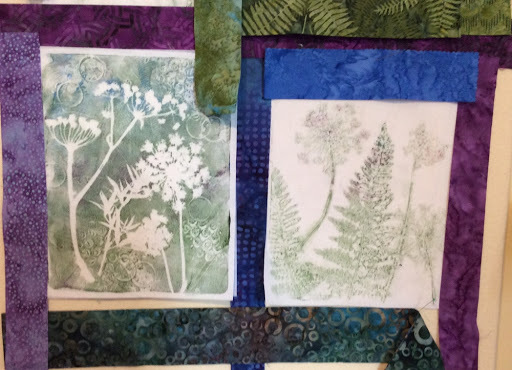 Maybe I'll be inspired to hand quilt the whole piece. I'll have lots of time to decide. I've saved the best for last. 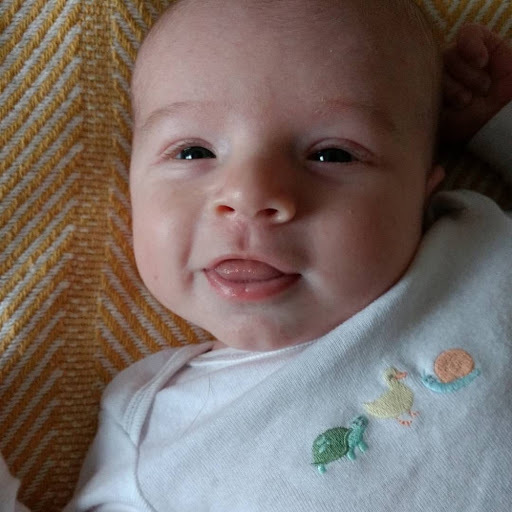 My new little grand son, Ollie. About 6 weeks. Have a great weekend! I may not get back here for a couple weeks depending on recovery. We were meant to be on our way home from PEI today but plans change. 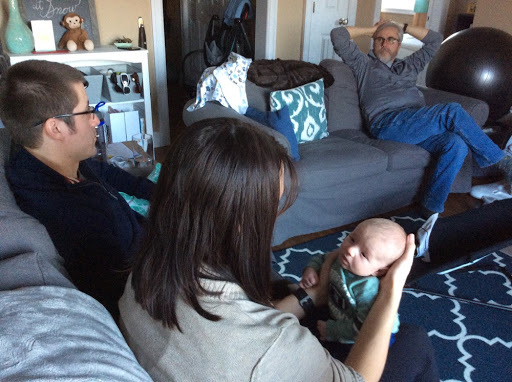 We spent New Years with my daughter, her partner and baby and we had a short visit with my son and fiancé who came over for the day. 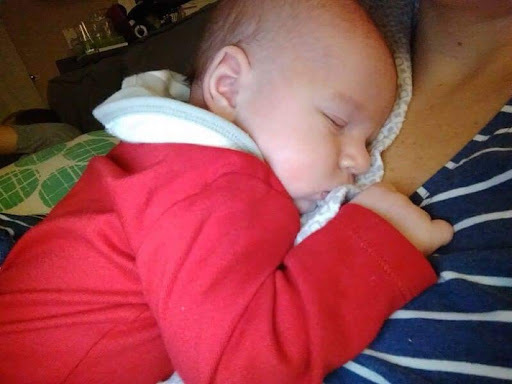 Hubby did get to spend some quality bonding time with a snuggling baby. But then later back at the hotel, he started coming down with a cold. We decided to check out in the morning as we wouldn't visit baby again. I did, however, spend some time at my sister's pot luck held at her restaurant. It was fun seeing everyone and all the little ones. 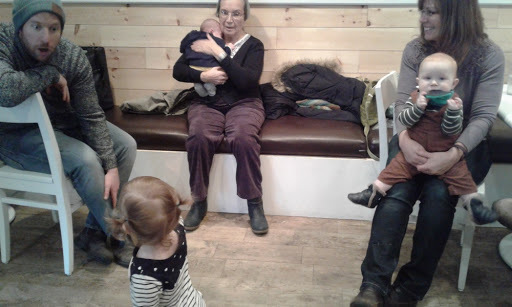 There were 4 nieces and nephews with their partners, plus their children, a sister in law, a sister, two brothers, along with spouses and my mother wither her husband. Lots of family on the island. My mom was pretty taken with baby Ollie. She held him for some time; he seemed to calm her. We live about 4 hours away so we'll have lots more visits. I didn't feel too badly this morning when I arose to a beautiful winter day. day. My day has been all about balance. Hmm, I'm still searching for a word of the year, I must add that to the list. 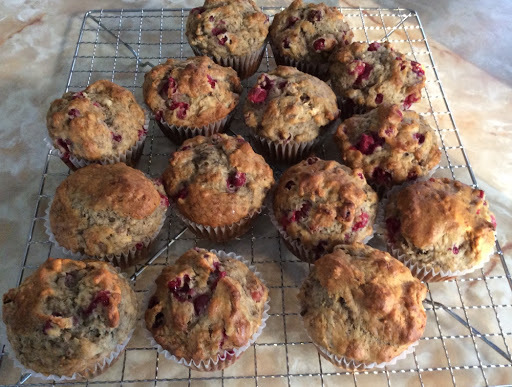 I made banana cranberry muffins and cleaned out one drawer while they baked. Simplify is another word I think about as I clean. Then I went for a snowshoe where I fed a few chickadees and took in the views and clear air. 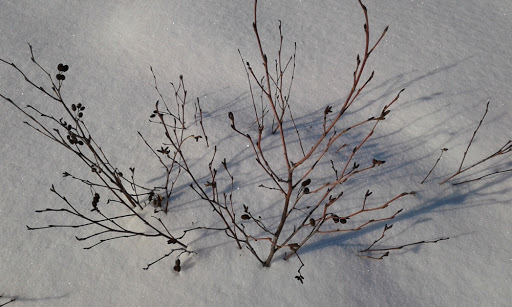 I love the patterns that bare branches make against the snow. 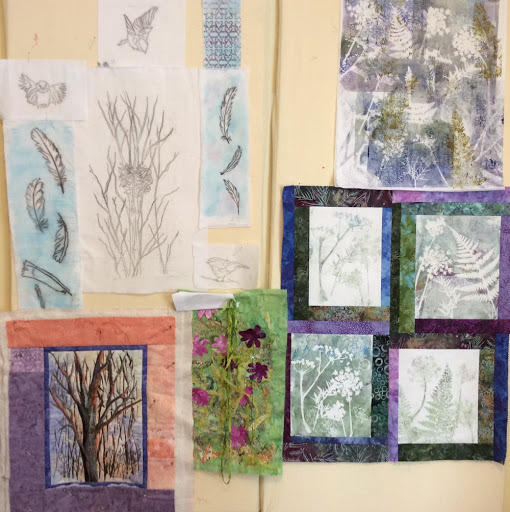 After a leisurely lunch, I took my tea into my sewing room and spent some time pulling out batiks to match some of the gelli prints I did the other day. One of my favourite things to do! I've loosely arranged them on my wall in no real order. I'd like to get them mostly together before my surgery a week from today. It will give me something to look at and think about during my recovery. 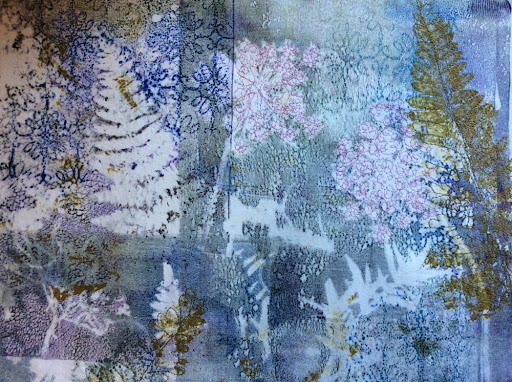 I think it will involve my usual black free motion outlining and then perhaps some hand stitching and embellishing. I've got some luscious fibers that I'm itching to use. All in all it's been a good start to the new year despite coming home early. And by the way, hubby is not too sick either. It's a mild cold.